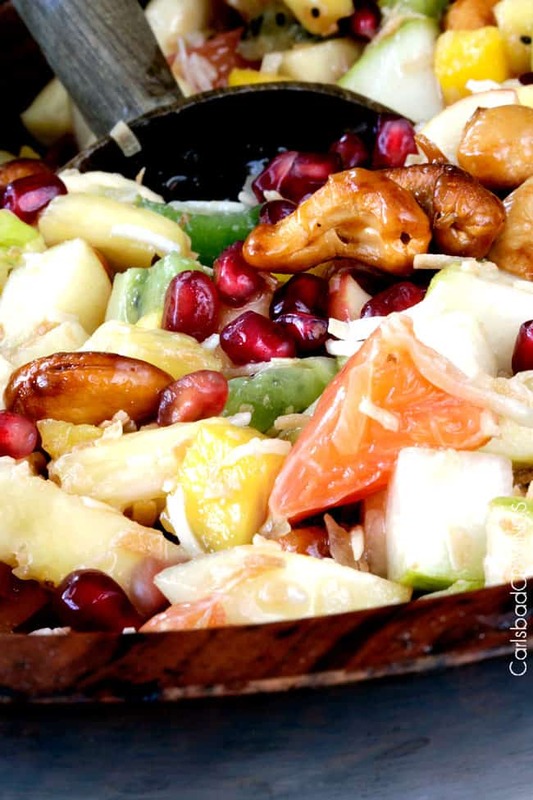 Sweet, refreshing, crunchy Tropical Winter Fruit Salad with Caramelized Cashews and Pomegranate Vinaigrette sprinkled with toasted coconut bursting with pineapple, mangos, oranges, apples, pears, kiwis, bananas and pomegranate arils. Mmmm… Hello tropics. We are enjoying another uncharacteristically warm San Diego winter (instead of 60’s its 70s), warm enough to still arm Kiwi (my adorable French Bulldog) with her life jacket and paddleboard every Saturday. 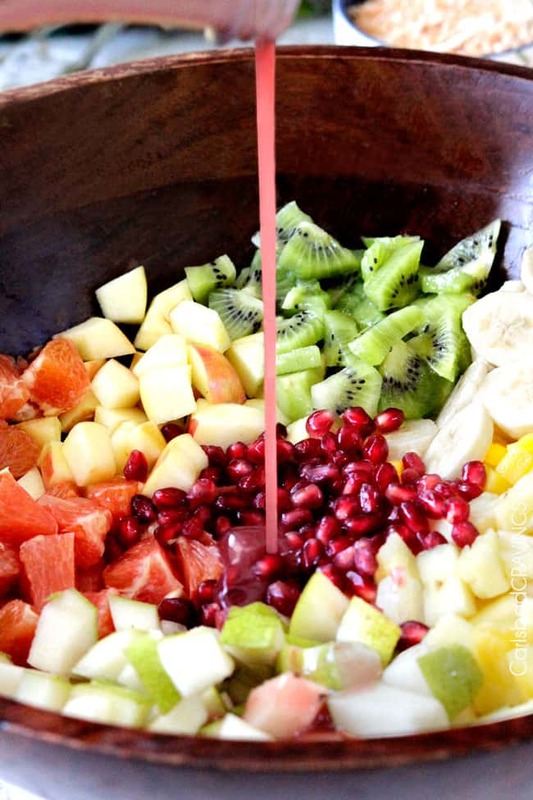 Still, I find myself mostly whipping up winter comfort foods and cozy soups, leaving me longing for a taste of the tropics so I’ve concocted my own tropical paradise in this Tropical Winter Fruit Salad. Longing be gone. 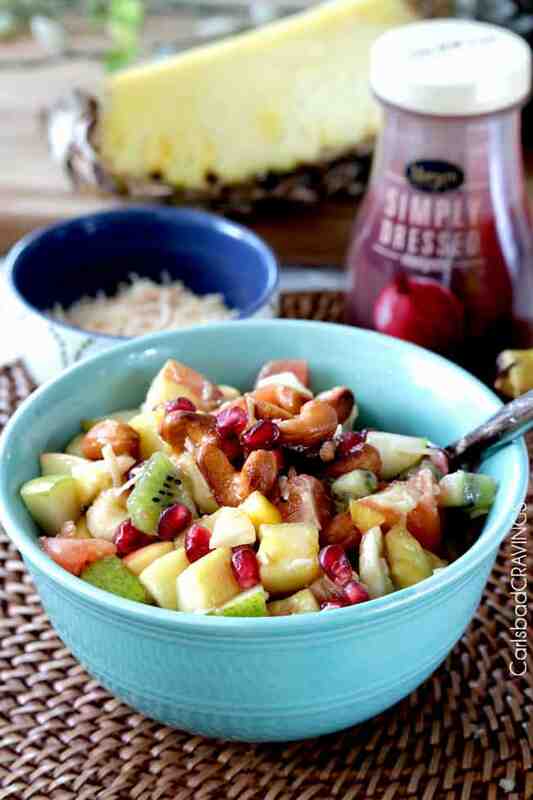 This Tropical Winter Fruit Salad is another favorite along with my Pina Colada Fruit Salad and Winter Fruit Salad with Honey Lime Poppy Seed Dressing. 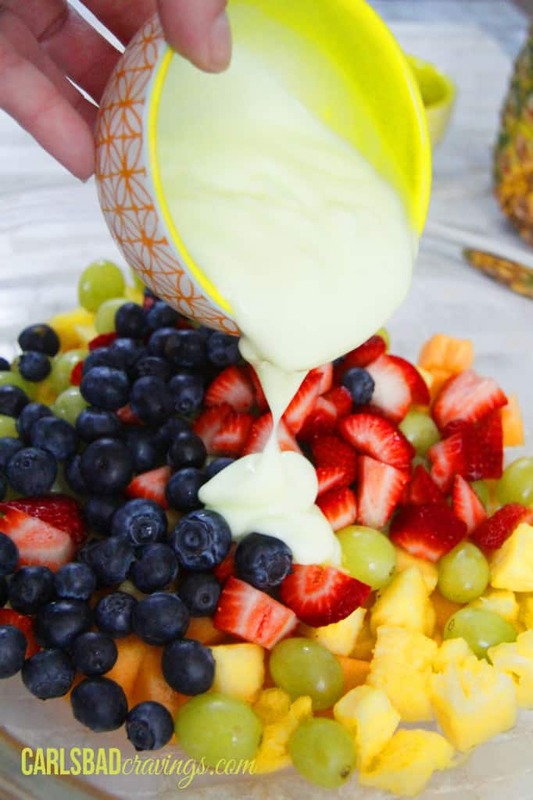 With one bite of this tropical fruit salad, your taste buds will be doing the hula. 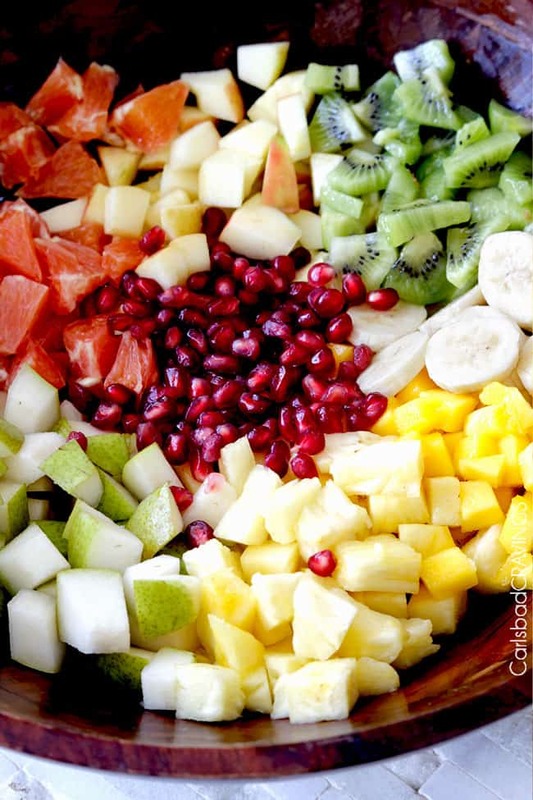 But this salad isn’t just tropical fruit, which would be delicious but not completely paradisiacal. 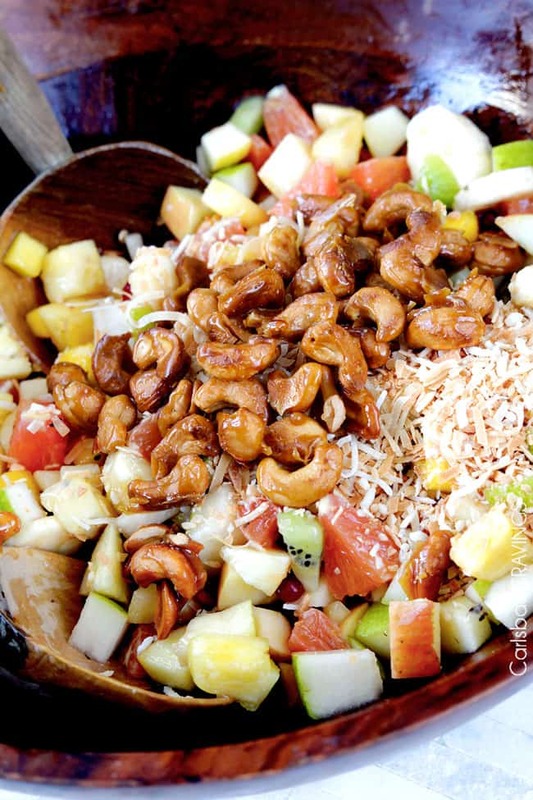 This salad is mixed with a sea of toasted coconut and sprinkled with 5 Minute Caramelized Cashews that taste like crunchy candy. Their toasted, caramel nuttiness accentuates the sweet citrus fruit so perfectly that I was searching for these precious little cashew morsels to devour in every bite. They belong in every bite. You might want to double the batch. And then all drizzled with sweet, slightly tangy, slightly creamy, Pomegranate Vinaigrette goodness enveloping every piece of fruit. For the Pomegranate Vinaigrette, I use Marzetti Simply Dressed Pomegranate Dressing Vinaigrette and it is amazing! I had never tried this dressing before and now I don’t know how I lived without it. As much as I love to make my own dressings, it is so nice to have a dressing on hand that instantly infuses everyday fruits and vegetables with robust flavor with a just a few drizzles. The symphony of flavors and textures of the fruit, cashews, coconut and pomegranate dressing are a match made in heaven – or in this case, paradise. 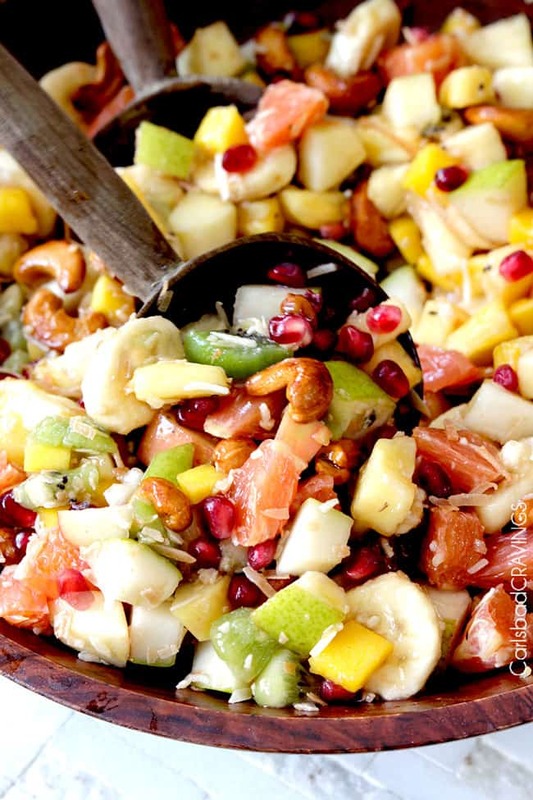 Tropical Winter Fruit Salad with Caramelized Cashews, and Pomegranate Vinaigrette. My kind of tropical paradise–anytime of year, any type of weather. Bon voyage to the tropics! 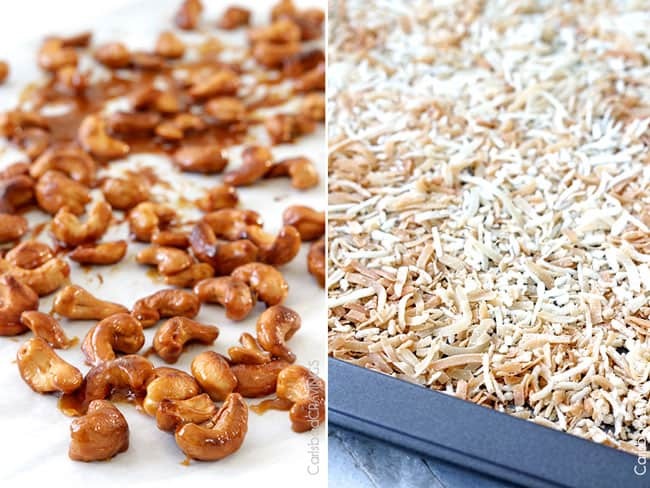 Prepare 5 Minute Caramelized Cashews according to recipe here. Toast coconut on a baking sheet at 350F degrees for approximately 5 minutes or until golden, stirring halfway through. Add fruit, coconut and cashews to a large bowl and toss with 1/4 cup Marzetti Simply Dressed Pomegranate Vinaigrette until evenly coated. 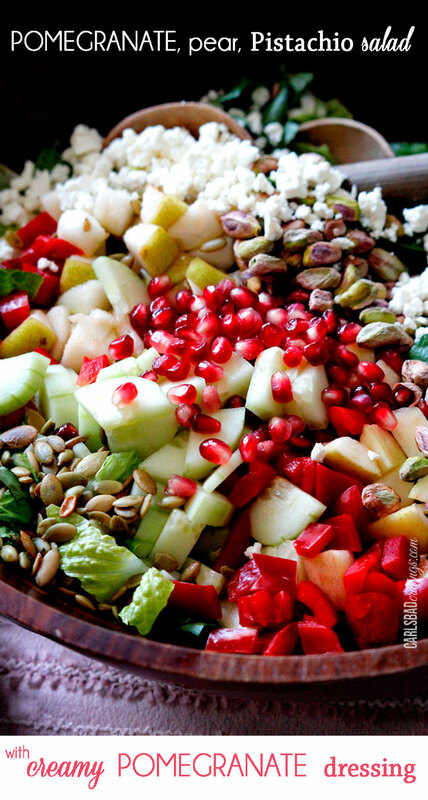 Refrigerate any remaining salad. *I use Marzetti® Simply Dressed® Pomegranate Vinaigrette located in the refrigerated section. **You can buy just the pomegranate arils if you don't want to deseed a pomegranate (1 pomegranate contains about 1/2 - 3/4 cup arils). 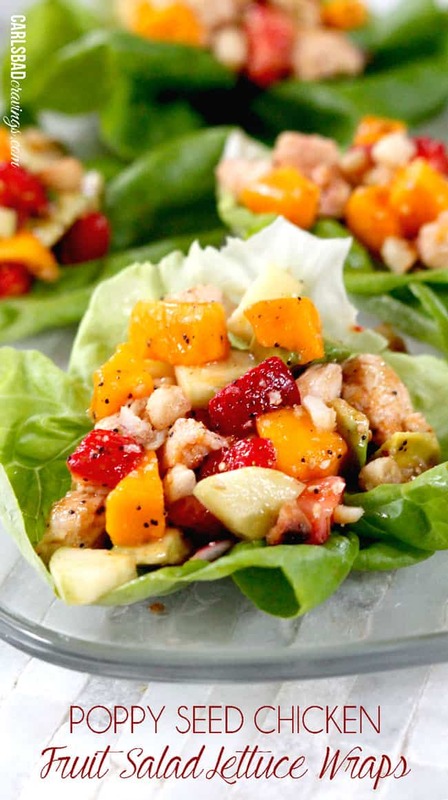 ***If you expect leftover salad and don't want the coconut to get soggy, either toss coconut with just part of the salad or top individual servings with coconut. 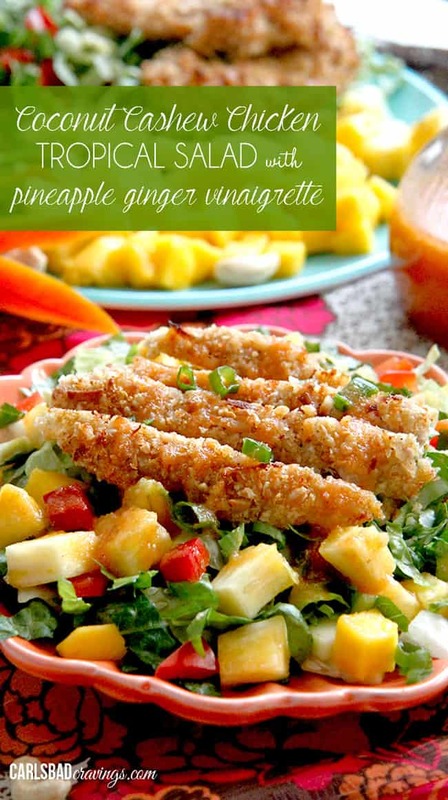 ***The salad keeps beautifully with the exception of the bananas and coconut if combined. The apples and pears do not brown due to the citrus in the salad, making this salad perfect to make ahead and add bananas, coconut and cashews at the last minute before serving. I’ll use Marzetti Simply Dressed with grilled chicken and packaged salad mix to prepare a quick and healthy meal. I would make a Caesar Seafood Salad for my family as we are seafood lovers and top with Marzetti Simply Dressed Caesar Salad Dressing.